The City of Owensboro is proud to partner with the family of Nicky Hayden for the unveiling of the Nicky Hayden Memorial Sculpture honoring the late MotoGP World Champion and Owensboro native. The public is invited to attend the unveiling of the sculpture on Friday, June 8 at 5:30pm on the front lawn of the Owensboro Convention Center, which will be the permanent home of the sculpture. 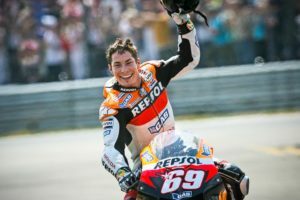 Mayor Tom Watson will read a proclamation declaring June 9th as Nicky Hayden Day, representing Nicky’s racing number “69.” Please join the community in this celebration of the commemoration of the Kentucky Kid’s legacy in his hometown.